The posterior leg raise should really be called the total body exercise because it strengthens your entire body in one move. You’ll be strengthening all the muscles of the leg you’re lifting. You’ll be building muscle endurance and balance on the stationary leg, and you’re working core too. Stand on your right leg only. Lift your left leg straight up behind your body about 6 inches. Pause for one second, and then slowly lower. Do 10 reps in a slow and controlled manner. The key is to keep your shoulders down and back, and keep your torso completely still. Repeat the move standing on your left leg, and lift and lower your right leg. The squat is a functional exercise. A functional exercise means you perform the squat-motion many times throughout the day. This is the exact motion used to pick something up off the floor. Practice this motion with a Squat and Reach Exercise. Begin with your feet slightly wider than your hips. Bend your knees and hips, and sit back and down into a squat. Lower your body about six inches. Pause and reach your right hand forward and toward the floor, then return to standing to complete one rep. Repeat your squat and reach forward with your left hand, then return to standing. Do 10 reps total. Squats are an essential exercise. You sit down and stand up many times during the day, so adding a squat exercise into your weight routine is functional. A functional exercise helps us gain strength to perform a daily activity. Here’s how to start: Begin holding one weight in each hand. Bending from your knees and hips, sit back and lower down about six inches. Pause for one second. Return to standing to complete one rep.
*Consult your doctor before performing exercise. Make the squat your essential exercise! A squat is a functional exercise. A functional exercise is a movement required often during your activities of daily living. How many times do you sit down and sit up during your day? Lots! Make the squat movement pattern your essential exercise. That means your main focus during a workout is to master, progress and challenge your squat exercise. Doing so will make this motion during your day much easier! Hold a weight in each hand. Stand with your feet hip width apart. Bending from your knees and hips, sit back and lower your body down about ten inches. Pause for one second to reduce momentum, then stand up to complete one rep. Do eight to twelve reps in a slow and controlled pattern. Keep your spine aligned and belly button in. Squat for total leg strength! Hold one weight with both hands in front of your body. Bending from your knees and hips, sit back and lower your body into a squat. Keep your torso aligned and abs pulled in tight. Return to your starting position to complete 1 rep. Start with 10 reps.
Work your legs and core all in one move with a squat. Mastering proper form on your squat opens the door to endless additional variations. The squat is also a functional movement, meaning you stand up and sit down countless times during your daily activities. So having adequate strength to do so properly means a reduced risk of injury. Keep your shoulders down and back. Keep your chin parallel to the floor and ears directly over your shoulders. Pull your belly button in. Maintain knee alignment over your ankles. Consult your physician before performing exercise. Do a Single Leg Squat for leg strength. Stand on your right leg only. Bend from your right knee and hips, and sit back lowering your body down about six inches. Keep your right knee lined up over your right foot. Maintain proper spinal alignment with your hips level. Now stand up straight again to complete one rep. Do 8-12 times. Repeat, standing on your left leg only. For better balance, extend both arms straight out in front of you. 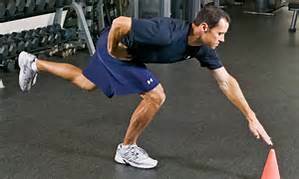 Progress to placing both arms across your chest. 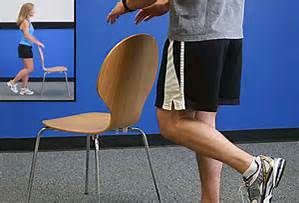 For even more of a challenge, reach forward and touch a point such as a chair or cone with your hand while maintaining proper form. Get Strong with Step Ups! Build strong legs with this challenging exercise. Hold a weight in each hand. Stand facing a stable bench or secure chair. Step up on the bench with your right leg only. Transfer your body up onto the bench. Slowly lower your body back to the floor leading with your left leg. Return to your starting position with both feet flat on the floor to complete one rep. Next, step up with your left leg, then slowly lower leading with your right leg. Begin with ten reps total. Maintain proper spinal alignment with your shoulders down and back. Maintain core stability holding your belly button in. Control is key. Slowly lift your body, pause, slowly lower your body, pause. No bounce. No swing. Exhale when you lift. Inhale when you lower. Stand on one leg for 10 seconds. Increase time to 30 seconds. Stand on one leg and place both arms across your chest. Stand on one leg and swing both arms forward and back. Stand on one leg and look side to side.